“Sailing. Takes me away. To where I’ve always heard it could be. When I heard Christopher Cross sing those lyrics as a young teen, I envisioned myself smoothly sailing with nothing but peace, sunshine and a cool breeze tickling my senses. During my last semester at Texas A&M University, I decided I would learn to sail. I needed six credit hours in order to graduate so I was enrolled in the first summer session. My roommate of over four years, Terri, was enrolled in summer school also and one of the courses she needed to take was a Physical Education credit so she signed up for sailing. When Terri came home and told me that she was taking sailing as her PE credit, I was a little jealous since I always dreamed of sailing to that place where I would be free. Did it really matter I had already completed all of my PE requirements? Wouldn’t the school let me take more – if I paid for them? “Surely my Dad wouldn’t mind paying for another needless credit hour,” I thought as I agreed to sail away with my friend for the next six weeks. I would be graduating in a few weeks and getting married a few weeks after that so we thought this would be one final bonding moment for us. Not only did Terri and I think sailing would be fun and help with our tans – which is important when you are in college – we thought it would be a breeze. (Pun intended.) How difficult could it be? We had survived organic chemistry and grasped geometry. We made it through our finance class though the professor, instead of teaching us about present and future values, spent most of the lecture time talking about working for Howard Hughes for over thirty years. (And, yes, Hughes really did wear Kleenex boxes as house shoes.) We even somehow managed to make a decent grade in our economics class regardless of the fact the professor we signed up with was rarely there but instead was in Washington DC advising President Reagan. “Sailing would be an easy ‘A,’” we thought. After taking the water safety test where we had to tread water for 10 minutes in bathing suit, blue jeans and tennis shoes, we were pronounced “ready to learn to sail.” On shore, we listened to the instructor tell us about the rigging, boom, rudder, bow and stern. He showed us how to right the boat if it “turtled” and explained how to tack, or zig-zag, into the wind. With excitement, Terri and I carried our two-man sailboats to the water. We were finally going to get to sail. Americas Cup, here we come! Terri took the helm and off we went. I perched on the front of the boat and tried to duck when the boom swung around. We sailed across the lake and then turned around and Terri tried her hand at sailing into the wind. Though zig-zagging, or tacking, into the wind wasn’t nearly as easy as sailing across the lake, we had a great time in the sun. After managing to tack back to the starting point, we switched places. Terri was more than happy to turn the work over to me. She wanted to sit on the front of the boat and enjoy the day. I raised the sail. The wind quickly filled the sail and off we went. All of a sudden, a strong gust of wind filled the sail and the boat shifted directions. Terri didn’t shift directions. She had not been paying attention to much other than the sun’s rays. (Who can blame her?) She hadn’t been holding on, so when the boat jogged to the left, she slid off the boat – bottom first. Her less than graceful backwards plunge into the water left her legs as the last thing to leave the boat. This, in turn, didn’t allow her to “break” her fall and she was submerged before she knew it. The momentum of the wind gust really began to fill the sail and carry my boat away from Terri. I looked behind me to see her sputtering water out of her mouth and bobbing in the middle of the lake as I sailed away from her. What a great day for sailing! Now, if I could just figure out how to tack back to where she was waiting in the middle of the lake! It was a good thing we passed the water safety test because Terri had to tread water for quite awhile. In fact, another boat had to pick her up because I struggled to work my way back across the lake into the wind. My daily grade was not good. I eventually got the boat turned around and started to zig-zag across the lake into the wind. I quickly discovered tacking was quite laborious. So laborious that if not for the fear of flunking PE my senior year, I would have turned my boat around, let the wind carry me to the west shore, pulled my boat out of the water and start walking back to the car. When Christopher Cross penned the words “Sailing. Takes me away. To where I’ve always heard it could be. Just a dream and the wind to carry me. And soon I will be free,” he was NOT tacking. He obviously had the wind at his back and was freely gliding through the water – or paying someone to do his sailing! The first time I sang those words, I laughed because the image of my friend in the water immediately came to mind. Then a deeper realization hit me. With the wind at my back and totally surrendered to its force, sailing was fun and easy. My boat swiftly cut through the water, the wind cooled the sun on my face and the gentle lapping of the ripples on the side of the boat methodically soothed my soul. But when I had to turn the boat around and try to sail into the wind, rebelling against its force, the effort was great. I was attempting to harness the wind and sailing ceased to be fun. 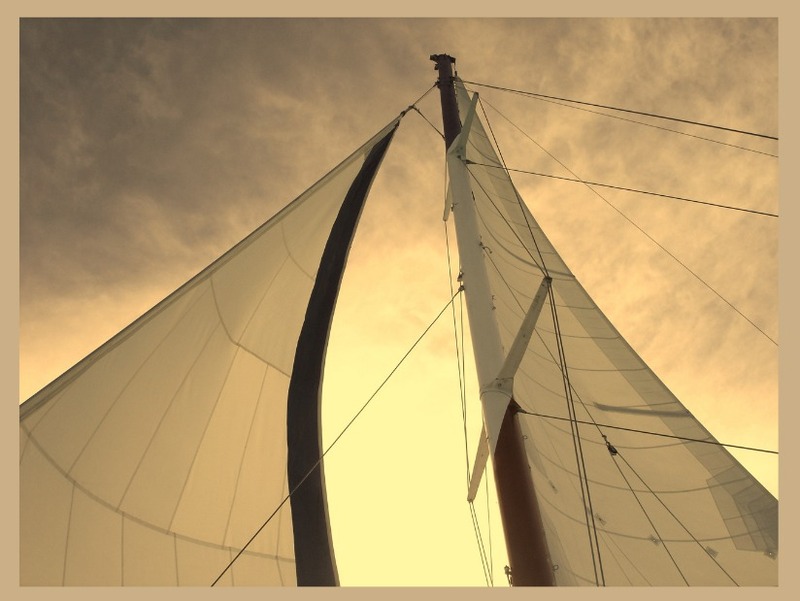 Are we truly willing to let the Lord be the wind in our sails? Are we going to surrender to the Lord’s direction – even if it means leaving a loved one behind – trusting the Lord to pick them up out of the water? Or are we going to try to go our own way – even though the process is longer and more difficult? So many of us choose to tack, or zig-zag, when all the Lord really wants is for us is to surrender to Him. To His force. To his direction. If you happen to be behind me the next time we sing the song “Be the Center” and you see my shoulders quake with laughter, it is because I am remembering my friend’s face as she suddenly slides off the front of my boat into the middle of the lake. If you then see me throw my hands up to the Lord in worship, you will know I understand the words “be the wind in these sails.” I am surrendering to His way. His direction. His freedom. Share the post "Sailing 2.0"
Shelly–I love your stories and the metaphors you use to make your points. You are a gifted writer and always make me smile–and, most importantly, reflect, relate, and realize how blessed I am to have you as a friend.